Large, airy, 2nd floor apartment w king and a/c and a refreshing cross breeze. 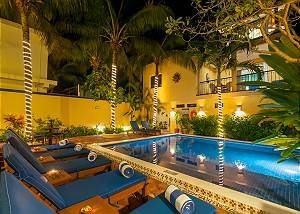 Private balcony overlooking the beautiful pool and garden. Well equipped kitchen with granite counter tops, free Wi-Fi. 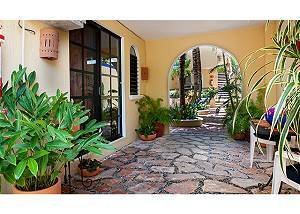 This immaculately kept property is a 2-minute walk to the beach, 8 blocks to the town square. 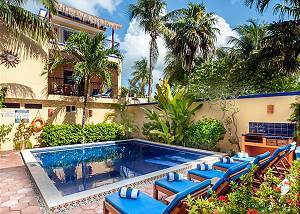 Relax by the sparkling pool in your lounge chair set in a tropical oasis. Office right on the property open 7 days a week. Bikes free for guest use. For those on a budget we have a hotel style room with a queen bed, bath with shower, flat screen TV, under-counter fridge, coffee maker and microwave. Enjoy your morning coffee in your own private garden patio. Spacious, comfortable, ground floor studio apartment with comfy king bed and A/C. Well equipped kitchen, free Wi-Fi, free bikes. 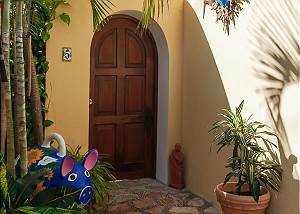 Two minutes to the beach and 15 minutes to the town square. Spacious, comfortable, apartment on 2nd floor with king bed and A/C. 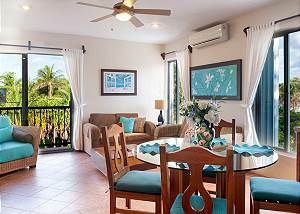 Enjoy breakfast on your private balcony overlooking the lovely pool and garden. Well equipped kitchen and all amenities including free Wi-Fi, bikes, flat screen TV. 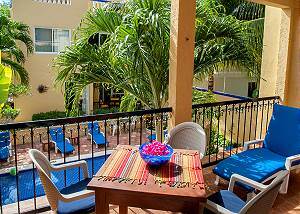 Enjoy your morning coffee relaxing in your personal patio overlooking the sparkling pool. Spacious, comfortable, ground floor apartment with comfy king bed and A/C. Well equipped kitchen and all amenities including free Wi-Fi, free bikes. Large, comfortable, ground floor apartment with king bed and A/C. Private, quiet garden patio. 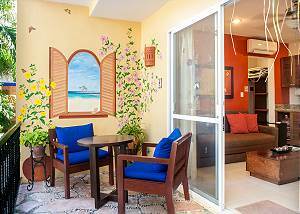 Well equipped kitchen and amenities like free Wi-Fi, flat screen TV. Free bikes. Roof-top yoga classes in winter months.